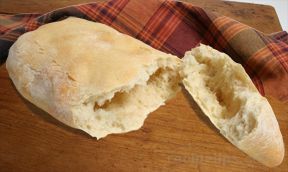 This traditional Cuban bread provides an open crumb, much like a French bread, with a crisp crust for a tasty "Cubano" sandwich or to accompany a meal. Cuban bread should be consumed in a day or so, since it lacks shortening, and therefore, has a very short shelf life. Grease a baking sheet to prepare it for 2 small loaves. In large mixing bowl, combine 4 cups of flour, yeast, salt, and sugar. Blend well. Heat 2 cups of water to 125º F and add to mixing bowl, beating ingredients with electric mixer for approximately 3 minutes. Add remaining cup of flour slowly, making sure it combines with other ingredients to form a non-sticky batch of bread dough. To hand knead the dough, remove it from bowl, sprinkle additional flour over a kneading area, and knead dough for 5 to 10 minutes until smooth and elastic. To knead with electic mixer and dough hook, work dough for approximately 5 minutes until elastic and smooth. Lightly grease a large bowl, place the dough inside, and cover the bowl with oiled plastic wrap. Allow the dough to rise in a warm location (approximately 90º F) for 15 to 30 minutes, or until the dough has doubled in size. Punch the dough to deflate and place it on a floured work surface. 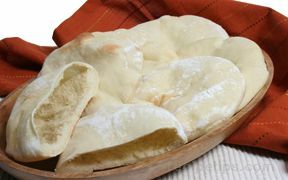 Form the loaves into round or oval shapes and place on the greased baking sheet. Slash the loaves with a cross or 2 parallel cuts. Fill a pan with hot tap water and place it on the lowest rack in a cool oven (do not preheat the oven). Put the bread loaves in the oven on the middle shelf above the water. Turn the oven temperature to 400º F, baking the loaves for approximately 45 to 50 minutes, and removing them when they are a dark golden tan in color. Using a wooden spoon or your hand, lightly tap on the bottom of the loaves, listening for a hollow and hard sound, which indicates the bread is properly done. Place the bread on a cooling rack and serve the same day it is baked. "I assure you I am not being ugly, but anyone that thinks this is a "traditional cuban bread" recipe has NEVER had real cuban bread. The biggest difference is the lack of shortening. 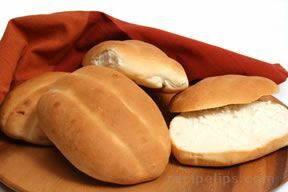 truly authentic or traditional "pan cubano" (cuban bread) uses pork lard as shortening. It is also cooked in a dry oven - not one with a water/steam tray. I am giving you 4 stars because this is certainly a bread recipe and sounds fine. However, this is NOT, by any stretch of the imagination, Cuban Bread." "This is a wonderful bread. So very easy to make but so good. I let the mixer and the dough hook do all the kneading for me and while I was worried that taking the easier route might prove disastrous it worked out great! My husband loved the bread and had several slices before dinner. I had made a Chimichurri to go along with it as a dipping sauce. Very tasty. My only recommendation is to remember that the water turns to steam when baking. Forgot about this and got a facial when I opened the door the first time!" "I have tried some cuban bread recipes in the past with terrible results...this is still in my oven but it looks and smells perfect! The process and baking from cold oven is key. Love it!!!"